MANCHESTER-based trumpeter, composer, arranger and bandleader Matthew Hallsall appears to have played a masterstroke with The Gondwana Orchestra’s new album, Into Forever. 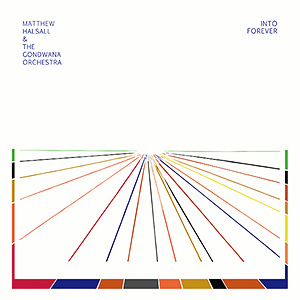 The chilled, slowly-shifting soundscapes of Matt’s previous releases, though hugely popular with audiences, have not especially struck a chord with me; the spiritual koto-and-harp atmospheres of 2014’s album When The World Was One and more recent EP Journey in Satchidananda/Blue Nile sounding particularly ambient, even soporific. But the realisation of a long-held desire to work with vocalists has, like a smouldering taper to a wick, brightly ignited Halsall’s compositional skills here like never before. Halsall first met Manchester ‘soul poet’ Josephine Oniyama whilst collaborating on a BBC Radio 3 programme, consequently sparking his imagination – and in enlisting both Oniyama and vocalist Bryony Jarman-Pinto, along with a string ensemble, something beautiful (and often pleasingly retro in feel) has occurred. Blending the nine-piece Orchestra’s world/jazz hues with these new colours, there’s an awakening of sound whose multiplicity recalls Air (of Moon Safari fame), Nils Frahm, The Cinematic Orchestra… and going back further, glimmers of Chick Corea’s Return to Forever. The 11-track sequence is introduced by Josephine Oniyama’s strong, clear vocal in Only a Woman – illustrating a daughter’s eventual role reversal in caring for her elderly mother, its gently buoyant pulse is tempered by lush strings and shimmering harp glissandi. And the memorable octave-vocal of As I Walk – at steady-though-hypnotic walking pace marked out by strings and deliberate percussion – is finely decorated by harp and wordless backing. Serene interludes are to be found along the way, Dawn Horizon heralding the especially engaging Badder Weather whose Santana-like groove is illuminated by Oniyama’s emphatic vocal delivery. These Goodbyes reveals a deep, cinemascopic yearning (dedicated to the passing of one of Halsall’s friends and supporters), whilst fast-travelling The Land Of is clearly pictorialised by complex, clattering drums and percussion, as well as deliciously mystic flute which, in following Longsham Temple, evocatively pitch-bends the slower melodies, perhaps suggesting a long journey’s arrival. Brief interlude Cushenden is majestically oriental, its strings resembling the world music explorations of Kronos, and title track Into Forever becomes meditative in its combination of Josephine’s Oniyama’s vocal lines and Halsall’s blue trumpet, upheld by delicate harp ostinati and droplet piano elaborations. Similarly transcendental Dean Park (prompted by an outdoor Tai Chi class the trumpeter witnessed in Taiwan) suggests the quietly-flowing streams of a Chinese garden, complete with bell-like chimes, which Halsall’s smooth improvisations pervade. And to close, Bryony Jarman-Pinto’s quirky, inflected vocals animate Jamais Vu (a fascinating voice which should be employed more extensively in later projects). Still with Matthew Halsall’s trademark Eastern-flavoured ambience, this is a recording whose new-found vocal richness suggests further possibilities for development, and is sure to be a hit with established fans. Released on 2 October 2015, Into Forever is available in CD, 12″ vinyl and digital formats from Hallsall’s own label, Gondwana Records (at Bandcamp) as well as online and in record stores.